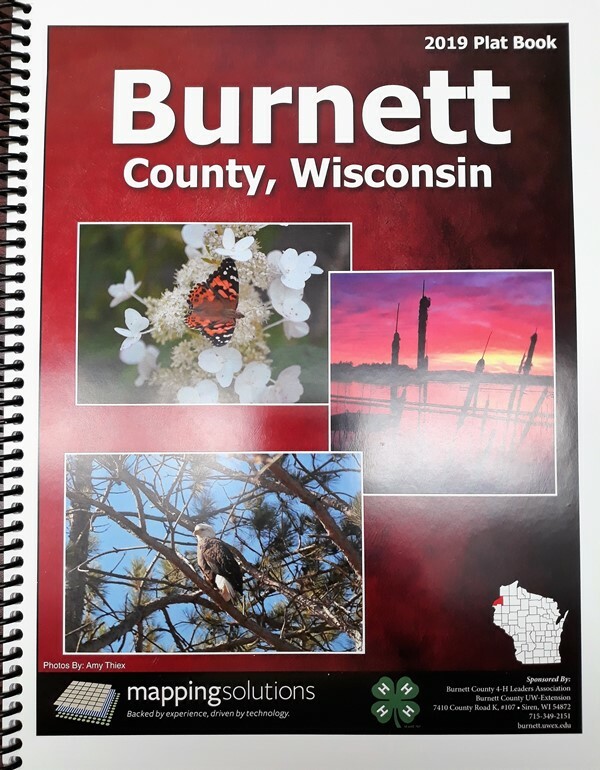 The 2019 Burnett County plat book includes road and property maps, as well as current aerial photos, for each township. All profits go towards supporting 4-H youth programs. Plat books may be purchased at the County Clerk’s office in the Burnett County Government Center for $32 (includes tax). Plat books may also be purchased by mail for $40 (includes tax and shipping). Please make out your check to “Burnett County” and mail it to: Plat Book, 7410 County Road K #105, Siren, WI 54872. Private vendors who will also be selling the 2016 plat books include: Big Mike’s (Siren), Log Cabin Store (Danbury), Burnett County Sentinel (Grantsburg), The Main Store (Webb Lake), and Inter-County Leader (Siren, Frederic, Shell Lake, and St. Croix Falls). For out-of-state and tax exempt information, contact the Clerk’s Office at 715-349-2173.